Do you (or your clients or loved ones) struggle with anxiety? Fortunately, there’s an all-natural way to calm anxiety and support your body in coming back into balance: essential oils! In this special Essential Oils Video Class, you will explore some of the most powerful anxiety-relieving essential oils, and the research behind WHY they work. You’ll learn about three essential oil components that have been proven to calm the nervous system, ease anxiety, and even help reduce pain! And you’ll learn to make 3 easy recipes that can help prevent and treat symptoms of anxiety all day long. You’ll walk away from this course feeling confident in your ability to support yourself + others to reduce anxiety – 100% naturally! Aromatherapy changed my life – and I founded Aromahead Institute in 1998 to share my love of essential oils with others. Thousands of students from more than 170 countries have studied with us since that time. 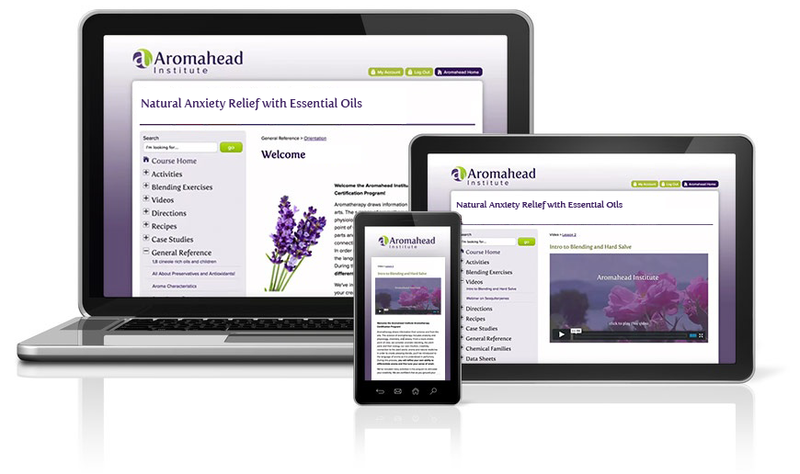 The Aromahead Institute team is a dedicated community of educators, with a tremendous wealth of knowledge about Aromatherapy and natural health. Our teachers are all Certified Aromatherapists with years of experience. BONUS: I’ll also teach you to make a luscious vanilla-infused jojoba oil. It’s so easy to make and smells simply divine! You’ll love using this in all your favorite blends and recipes. Aromahead Institute's Essential Oil Video Classes are in-depth immersion studies on how to use essential oils to support with a specific symptom (or set of symptoms). They are designed as a fast and effective way to educate yourself with the very best knowledge, research and recipes available on how to heal naturally with essential oils. Natural Anxiety Relief with Essential Oils is an independent, self-study program. As soon as you register, you will have immediate, lifetime access to the class by logging into our beautiful user-friendly online classroom, which includes all of your written + video content. Start learning the moment you complete your registration OR sign up now and get started later! There’s no required time frame to complete the course – so you can take it at your own pace and return to your materials as often as you’d like. A beautiful, user-friendly online classroom where you can access your lessons + resources anytime at your convenience 24/7. An in-depth video training taught by award-winning Aromatherapist Andrea Butje that you can watch as many times as you like! A PDF of all the slides from the training – so you can quickly access each one without watching the entire video. Original Aromatherapy recipes and blends (compiled into a beautiful color PDF that you can download and print). 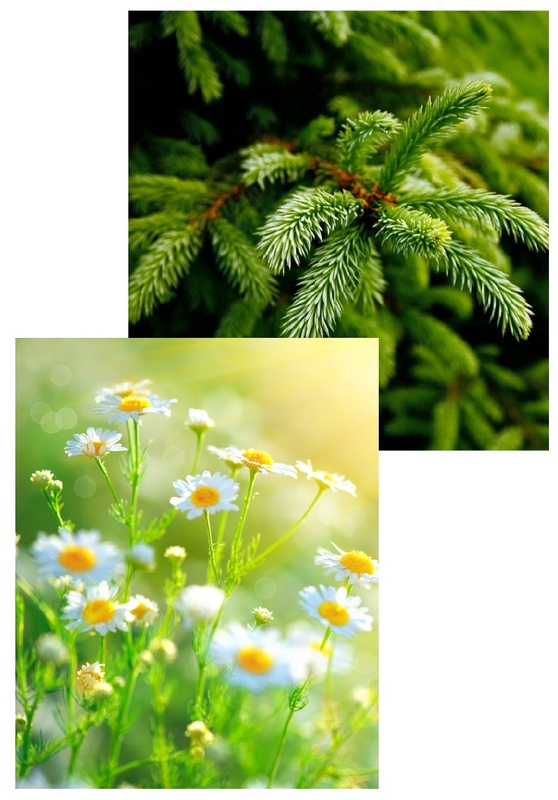 An extensive list of resources for high-quality Aromatherapy products and related services. Unlimited access to all your course materials and videos – even after you have completed the program. You have unlimited access to your course materials – as well as any subsequent updates to the course content – even after you have completed the program. Your Video Class will be led by Andrea Butje, an internationally-recognized Aromatherapist who is changing the educational paradigm through her inspired approach to teaching + creating community online. 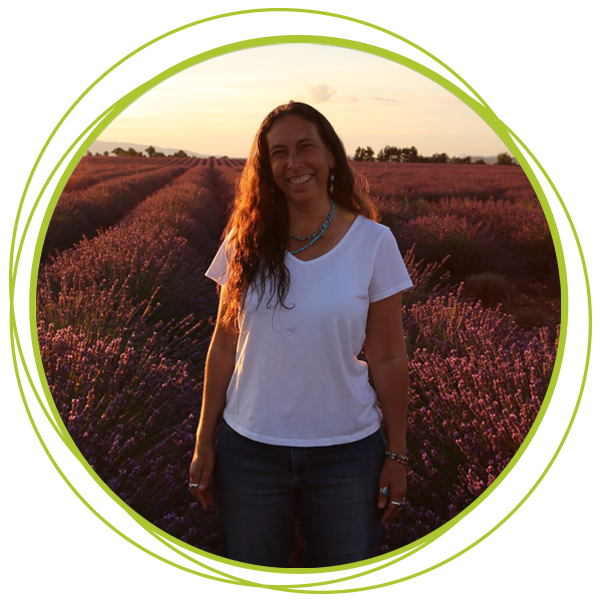 Andrea founded Aromahead Institute in 1998 to help people everywhere learn to use essential oils safely and effectively. Thousands of students from more than 170 countries have studied with Aromahead since that time – and many of our alumni have gone on to pursue successful careers and businesses in Aromatherapy and the Healing Arts. In 2013, Andrea won the Alliance of International Aromatherapists' Lifetime Achievement Award for her heartfelt work in educating and connecting people involved in all aspects of the Aromatherapy industry – from those who are new to using essential oils, to renowned authors and distillers. Yes! This is an entry-level, in-depth class – open to all learners. No previous Aromatherapy training is required. Yes! All the online classes at Aromahead Institute are self-paced. You can complete them on your own time, from anywhere in the world that you can log on to the internet. It depends! Most students complete this course (including making the recipes) within a few days to a couple of weeks. However, the program is completely self-paced, which means you can slow it down or move through it more quickly, depending on your learning style and availability. You’ll have permanent unlimited access to your course materials – as well as any subsequent updates to the course content – even after you’ve completed the program. There are no specific supplies needed for this online class. However, you may wish to purchase some supplies in order to make the recipes you’ll learn in the course. We recommend starting the class now – and then deciding what blends + recipes you’d like to try as you go through the program. The choice is yours! Yes! Thousands of students from more than 170 countries have studied with Aromahead Institute, and we’d love to welcome you to our online community.